It's a dark time for the galaxy. The tyrannical rule of the Galactic Empire extends from one system to another, annihilating any desire for hope and peace. Worse still, it seems that the Empire began in secret the construction of a space station of combat of an immeasurable power. A motley group of heroes stand against this implacable threat. Their mission is to rally others to their cause, infiltrate the heart of the Empire and steal Black Star's plans before it's too late. The Advent of the Empire offers a plethora of new options for the Star Wars board game: Rebellion. The protagonists of Rogue One: A Star Wars Story join the fight for the destiny of the galaxy, accompanied by iconic characters from the saga such as Jabba the Hutt. You'll also discover new vehicles, as well as movie fighting rules that offer intense battles with multiple twists and turns. Whatever your allegiance, this expansion contains the essential tools that will allow you to free the galaxy or to bend it under your yoke. The hour of the fight has come! Be careful this game is an extension of Star Wars: Rébellion and cannot be played alone. 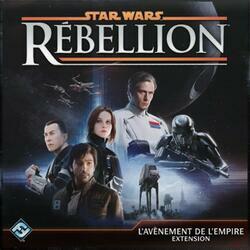 To be able to play it you must have a copy of the game Star Wars: Rébellion .